Alaska is the largest state in the USA and known romantically as the Last Frontier. It’s a wild and spectacular wilderness with vast landscapes of unfathomable natural beauty that seemingly stretch to infinity. The Yukon Territory, which is set between Alaska and Canada (and administered and governed by Canada), is one of the largest and most scarcely populated areas of North America. One of the most beautiful states in North America, there are few places with the breathtaking views and natural wonders of Alaska. Home to a vast selection of wildlife, mountains, rivers and glaciers, you’ll find it difficult to beat the stunning surroundings of this glorious state. 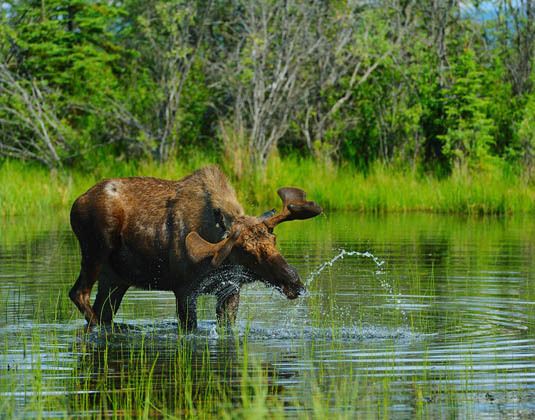 Iconic Alaskan highlights abound in the Southcentral and Interior regions, with Anchorage, Denali, Fairbanks and the Kenai Fjords all within the boundaries. This region enjoys endless daylight hours in summer while in the winter, you can often see the incredible Northern Lights. Most visitors will begin their Alaskan adventure in the urban enclave of Anchorage, which offers museums, galleries, great shopping and nearly 200 parks. Head north from the city for Denali National Park, Alaska’s most popular attraction and home to Mt McKinley, North America’s tallest peak, as well as a vast unspoiled terrain of glacial rivers, massive peaks and tundra. There’s also lots of wildlife, including moose, caribou, grizzly bears, Dall sheep and wolves. 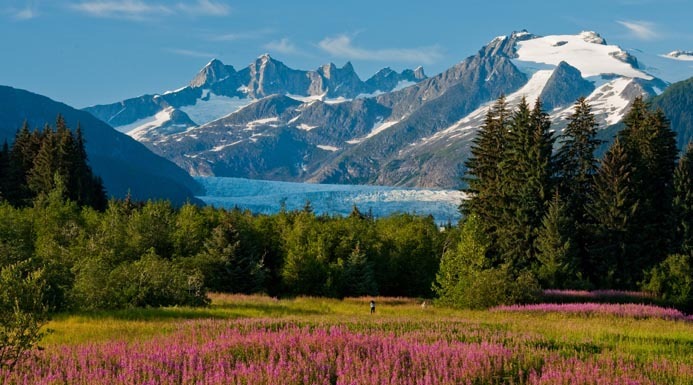 Other places include Fairbanks, which is a great base for exploring northern Alaska and its gold rush heritage; Alyeska, which is your gateway to the Chugach Mountains; and Tok, an outdoor enthusiast’s paradise. Cruising is the most popular way of exploring the Inside Passage, a region of massive glaciers, wildlife-filled fjords, coastal mountains carpeted with majestic forests and lush inland scenery. However, independent travellers can easily get around using ferries, water taxis and island-hopping planes. Alaska’s capital, Juneau, is the main city here, along with Sitka, with its mix of Russian and Native Alaskan history; Skagway, where gold rush fever lives on; and charming Ketchikan, which has an amazing collection of totem poles, diverse attractions and activities. The Yukon Territory, in Canada, is one of the last pristine wilderness areas left on earth, with a rich cultural heritage, fascinating gold rush history, legendary road trips, incredible scenery and warm hospitality. Whitehorse, also known as the Wilderness City, nestles on the banks of the famous Yukon River and is a great starting point for explorations of other Yukon areas including the Southern Lakes, where mountains crested with glaciers meet clear blue lakes and endless boreal forests sit in between. The small village of Haine’s Junction is surrounded by a magnificent, rugged landscape and lies on the edge of a vast wilderness; it’s also the gateway to the stunning Kluane National Park. Once a booming mining town, Faro has reinvented itself as a mecca for those seeking wilderness and rural experiences; beautiful Dawson City is the prime Yukon gold rush town and Beaver Creek, which is home to the White River First Nations, is the Yukon’s gateway to Alaska. Why visit Alaska and the Yukon? Our vastly experienced travel advisors are passionate about Alaska & Yukon . With first-hand knowledge of when and where to go they can create the perfect holiday experience for you, at the best possible price. 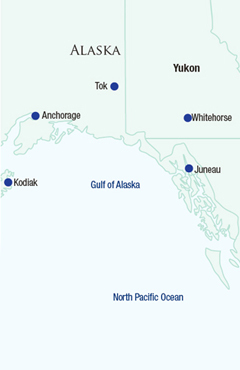 Flight duration: Flights from the UK operate via Seattle to Anchorage and the flying time is around 141/2 hours. Local time: GMT -8 hours (Alaska); GMT -7 hours (Yukon Territory). Best time to travel: The best time to visit Alaska and the Yukon is mid-May to mid-September as the days are long and temperatures surprisingly pleasant, although there is a chance of rain too. However, temperatures vary wildly depending on which region you plan to visit, with visitors sometimes experiencing all four seasons in one day! 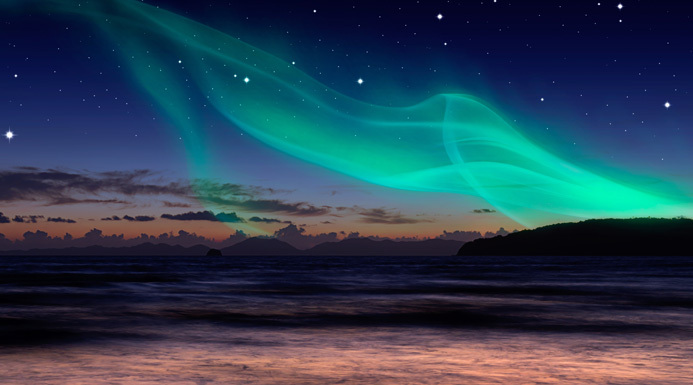 Your best chance of seeing the Northern Lights is during the cold, winter nights between September and April.